Bobby Joe, a “bohemian” artist, unlocks and enters his aunt’s jewelry shop on a holiday. Already agitated and desperate, he is further upset when Sylvie, an employee, enters unexpectedly. The drama intensifies as he seeks to avoid his shame and guilt with increasingly angry, accusative and threatening behavior. At the height of the action Sylvie faints, and a Grotesque Man enters, speaking in strange rhymes. With shock, Bobby Joe recognizes the deformed little man as an aspect of his own self, thus he is prevented from “crossing the Rubicon” into crime. When Sylvie recovers, she relates a dream about Bobby Joe’s higher self, and the two begin to form a strong, affectionate bond. American, 1950’s; a cast of 3; 25 minutes long. Brian Corelli is a student majoring in criminology and works part-time as a P.I. (private investigator). Involved in a missing persons case – a government employee – he is led to an office in the abandoned Saint Leger Building to witness payoffs through the window of a nearby warehouse. He has settled into a tiresome night of surveillance, when who should enter but the Detective, saving Brian’s life, drawing a parallel between the missing client and Saint Leger, and revealing aspects of his own mysterious Being. Contemporary American; cast of 3, and a running time of 25 minutes. Brother Dog, Sister Bird and Brother Mule meet on a country field and discuss the lamentable experiences of most creatures in the USA today. Brother Man, they decide, has created an unnatural, mechanical world, weaving more entrapping webs that Sister Spider, with none but himself the victim. They resolve to circulate a Declaration proclaiming that the human kingdom has sunken below the level of the animal kingdom. But then the magnificent Phoenix appears. A cast of 4; 7 minutes long. 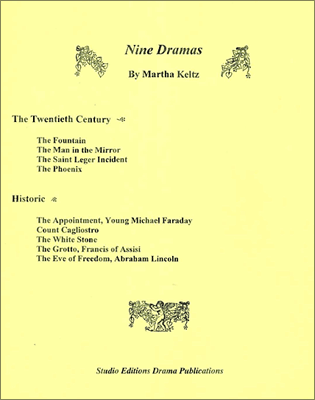 This play is set in London, England, from December 1812 through March 1813. The action follows the momentous time in the young scientist’s life when he made the transition from journeyman bookbinder to laboratory assistant for the renowned chemist, Sir Humphry Davy, at the Royal Institution. All the youthful idealism, excitement, discipline and humility are here that later matured in the great physicist who discovered the principle of electromagnetic induction. The play is historically accurate, drawing upon young Faraday’s correspondence. The cast of 5 includes Sir Humphry Davy; the running time is approximately one hour. It is known in history that Count Cagliostro was a Freemason, in the Coptic stream, and was influential in the French Court prior to the French Revolution. During the Revolution, he was captured by the Inquisition and imprisoned in the fortress of San Angelo, in Rome, where he died. This one-act play, with a cast of 5, portrays Count Cagliostro on the last day of his life, when, with his extraordinary imagination, he calls forth loved ones from his past. The story of Coinneach (Kenneth) Odhar, the seer of the white stone, is known in Scotland. Kenneth lived in the 17th century and it is said he was put to death by Lady Isabella Seaforth for revealing what he saw in the stone. This action-filled one-act play can be performed on an abstracted double set and has a cast of 5. The White Stone is an imaginative retelling of the Scottish story; Kenneth survives his trials and is saved and ultimately redeemed. This 25-minute play is written entirely in free verse. It is in three scenes, though all of the scenes take place in the Grotto. The time is the early 13th century. The three characters are: Francis, a Leper, and a Holy Man. The play draws upon Spiritual Foundations of Morality, three lectures by Rudolf Steiner. In these lectures the mission of Francis – to eliminate leprosy from Europe – is revealed, and the drama closely follows the content of the Spiritual Foundations lectures. This one-act play has a running time of approximately 40 minutes. It takes place in a quiet room in the White House, Washington DC, early March, 1862. The characters: Abraham Lincoln, the Guardian (as a slave), a Teacher (as the Black Horseman) and an Angel. Weary from trials and demands of the Civil War, and in melancholy despair over the recent death of his son, Willie, Lincoln has great need for quiet moments, late on this bitter March evening, the eve of the drafting of the Emancipation Proclamation. Prompted by a reading of Chapter Six from Revelation, recurring dreams of Willie, visions of the battlefield and the nation’s physical and moral wounds, Lincoln’s consciousness is brought to the threshold of the spiritual world. Copyright © Studio Editions/TC Pubs 1991-2014. All rights reserved.